The Rivendell Region Guide takes your adventures West across the Misty Mountains to the Last Homely House, expanding play into eastern Eriador, covering not only Rivendell itself, but Angmar, Fornost, Mount Gram, Tharbad and everywhere in between. There are also rules for creating your own Magical treasure, playing High Elves of Rivendell, turning the baleful Eye of Mordor on your company, and facing more powerful adversaries than ever before. Background for the Last Homely House, Rivendell, the sanctuary of Imladris. A history of Arnor, Angmar and the Rangers of the North. A bestiary of undead creatures, from Bog Soldiers and Barrow-wights to the Lord of the Nazgul himself, the Witch-king of Angmar. A new playable Heroic Culture: The High Elves of Rivendell. 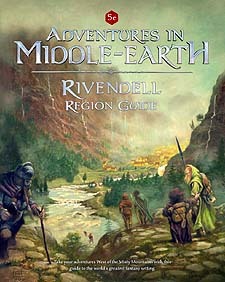 Rivendell Region Guide contains material previously released as Rivendell for The One Ring Roleplaying Game, fully converted to be compatible with Adventures in Middle-earth and the OGL rules.